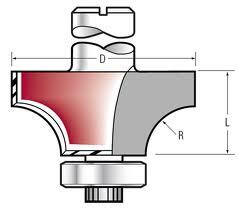 The Titman Rounding Over Cutter with Bearings (ROCB) Range provides a cutter that produces two shapes by changing the bearing. B16 bearing removes the quirk. 1/2" diameter shanks are available for a more stable cutting action. This Titman Router Cutter Range is supplied with B16 and B127 Bearings.